Hi everyone! It's my turn to post over at Twine It Up! with Trendy Twine. I have a sneak peek here, but please go visit the Trendy blog to see my whole project. 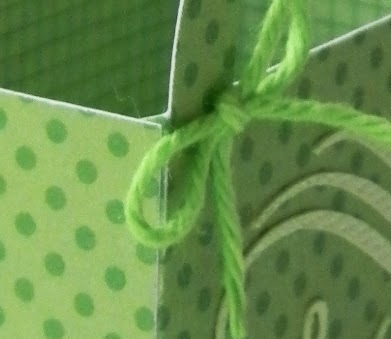 This is featuring the fabulous Totally Limeade Trendy Twine. It's still on sale over at the store. While you are over there, be sure to check out all the other fun goodies you can get for your treat packaging! Fabulous project, love the fun design! So glad that you are loving your new machine! Looks like a fun peek!!! Such a fun little treat box. And love the bright color, too.